Discovered by producer John Hammond, Sr. (who brought the world Bob Dylan, Leonard Cohen, Aretha Franklin, and Bruce Springsteen), Art “Ski” Halperin recorded a ten-song disc for Hammond’s CBS Records label, the first artist to do so. Ironically, after the producer’s death in 1987, Art was Touted as Hammond’s last discovery. At the time, Art was considered a rock guitarist on the rise. It is true, he has the chops to wail on an ax. However, he is distinctly versatile. Through these songs, Art applies the reggae beat to a number of writing scenarios. The first song out of the gate sets the gentle tone for this album. “Sing for Peace” could become the next reggae anthem, especially with the liquid harmonies of six beautiful voices joined with Art’s. Among those signature voices are jazz artist KJ Denhert, NY stage actress and original Hair cast member, Ula Hedwig, jazz/reggae singer Sherryl Marshall, Broadway actress/pop rocker Tamra Hayden, and a couple of very talented Broadway Kids stars (Kerry and Kathleeen Curran). Hedwig does consistent backup vocals on all but five selections, adding another layer to Art’s tracks. Art also takes a swing through heroic fantasy in “The Ring” and does a Caribbean retake on Jack and his infamous beans in “Jack and the Herbstalk.” Then, he presents a tender love song in “Quench This Love” that could have been written in the more idealistic and simpler time of the 50s but with more sophisticated lyrics and that reggae beat mixed with a chromatic harmonica. Art continues to explore love in “Sha La La,” a sweet tune with a layer of acoustic leads mixed with piano and organ, and “Just One Dance,” a very seductive track that could persuade almost any lady to walk into the night with the singer. But it is songs like “Baby Come Home” and that Allman Brother’s classic “Whipping Post” that Art’s rock chops slip into these tunes. However, Art never ventures too far from those roots reggae influences he has injected into his other songs on this album. Art’s reworking of The “Whipping Post” transforms that rock chestnut into a more gentler tune. Though Art’s guitar work is stellar, vocally it just doesn’t have the tortured soul of Gregg Allman’s delivery that made that song unforgettable. But Art’s version is one I’ll certainly return to again. Waves fittingly ends with Dennis Brown’s reggae classic, “Should I.” It ties this whole album together. But Art can’t help but lay down a couple of slow rock guitar screamers into this tune. It’s a nice showcase of his talents without showboating. 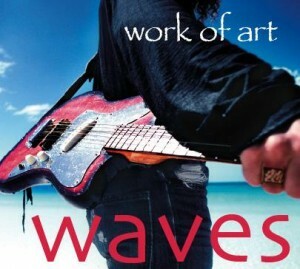 On Waves, Art plays acoustic/electric lead guitar, keys, banjo, harmonica, and percussion. He is supported by Al Maddy on rhythm guitar, Patrick Conlon on drumsand percussion, and Jay Cavanaugh on bass. Waves is a very listenable, restrained recording and certainly a surprise from a rocker. I’m curious to see what else Work of Art will bring us next. 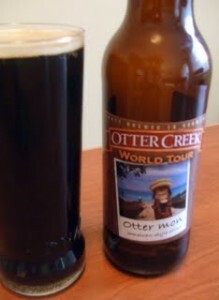 Beer Pairing: Otter Mon Jamaican-Style Stout from Otter Creek has a sweet start with very little froth and has touches of coffee, chocolate, and molasses, but has a long-lasting, dry, roasted finish.